Newcomers are always welcome. If it is your first time coming to Zen Center, the next question might be: Have you ever sat zazen before? If not, some instruction will be helpful. There is a beginner’s night on the 3rd Wednesday of every month, starting at 7:30 p.m. (Click here for our calendar of events ). Zazen instruction is also available Sunday mornings at 8:30 a.m., by appointment. (Click here for contact information to make an appointment). You could then join us for some or all of zazen at 9 a.m., followed by a dharma talk, work period, and tea. If you have sat zazen before, there are still some things useful to know before you come. The Zen Center is located in a residential neighborhood and is located in a residential dwelling. Look for our small sign just above the mailbox beside the front door, or for our address number of 1618 Bever Avenue on the right-hand porch pillar. When coming to Zen Center, it is a good idea to wear clothing that is loose-fitting and that won’t be distracting to others. One should arrive at least ten minutes before the start of zazen. (Click here for a daily schedule of sitting times). Although the schedule might say, for example, that zazen starts at 9 a.m., in actuality many people will have begun sitting by 8:55 so it is helpful to arrive early so as not to disturb them. Also, arriving early gives one a chance to familiarize oneself with the zendo (meditation room), use the restroom, and briefly meet some of the other people. In the end, though, if the choice is between arriving a few minutes late and not coming at all, we’d rather have you come! Lastly, if you are coming with a larger group of people (four or more) it is very helpful to contact the Zen Center ahead of time and let us know. Our zendo is small, but we have the ability to expand it into the dining room with a little notice. The zendo is the focus of most Zen centers and there are customary forms governing behavior there. Observing these rules keeps us from colliding with each other and helps us with our practice. This brochure acquaints you with the forms observed in the Cedar Rapids zendo and offers some thoughts on their practice aspects. Every Zen center has variations on these forms. Knowing our ways will surely help in practicing elsewhere, but there will be differences also. These forms are guides for practice. Forgetting or making mistakes is not an occasion for shame or embarrassment; it’s a chance to learn more about ourselves and our world. It’s not perfection that counts – it’s effort and attitude. 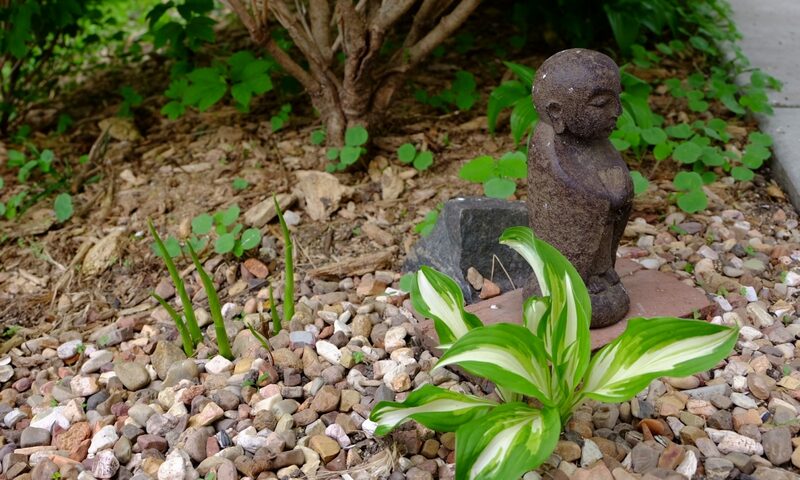 · Be on time: Arrive around ten minutes before zazen begins and take a seat in the zendo. Not hurrying preserves the quiet and helps us and everyone around us to settle into zazen more easily. · Shoes: Shoes go on the lower shelves beside or behind the door. If you need to sit to remove shoes, there’s a chair in the entryway. If your feet don’t get too cold, try sitting with bare feet. Taking off our shoes means we symbolically leave the outside world behind. We enter a place that’s different from our usual life – a place where we just sit in peace. Going barefoot or in stocking feet in the zendo also connects us with practice in the Buddha’s time when practitioners did zazen in bare feet. It’s also easier to sit cross-legged with bare feet or socks. If your feet get uncomfortably cold, let someone know and we’ll find a solution. · Clothing and such: Wear loose, non-revealing clothing in inconspicuous designs and colors. Avoid distracting jewelry and scents. Put your watch in your pocket and turn off your cell phone. By not distracting others or ourselves with sights, smells or sounds that arouse curiosity or attachment, we create peace and harmony. · Silence: Avoid speaking in the zendo. Chatter and conversation disrupt our awareness and our grounding in the present moment, and it distracts others. There is plenty of time for talk later. · Entering and exiting the zendo: Use the side of the doorway beside the shelves. On entering or exiting, bow in gassho. If you need a sutra book, take one from the shelves as you go in. Entering at the side shows respect for the Buddha, the practice and all things, including ourselves. Bowing in gassho is a sign of greeting and respect. · Finding a seat: With hands in shashu, walk around the room behind the zabutons to find a seat..
Avoid passing in front of the Buddha’s altar. Also avoid coming from opposite directions and running into each other. · Sitting down: Upon finding a place to sit, bow in gassho once toward the wall, turn and bow in gassho once to the seat across the zendo. Then sit on the zafu and begin zazen. Three rings on the zazen bell mark the formal start of zazen. When we bow: We are paying our respects to our practice, our wall, our situation, our sitting companions, and all beings. · Ending zazen: The end of zazen is signaled by sounding the zazen bell. Two rings announce the beginning of kinhin. One ring indicates that zazen is over and dharma talk or service is about to begin. Get up slowly, fluff up your zafu, bow in gassho toward your seat, turn clockwise and do the same toward the seat across the way. Bells are usually signals about what to do. The two bows are done whenever we arrive at or leave the zafu. · Kinhin: After bowing, turn to your left and stand in shashu. When the inkin rings, begin kinhin. When the zazen bell sounds three times, bow in shashu and walk at a normal pace back to your zafu, bow and sit down. During kinhin it’s OK to walk in front of the altar. If you must enter or leave the zendo, do so during kinhin. In walking, you’ll find yourself balancing between harmonizing your breath with your steps and keeping a good distance between yourself and the people in front of and behind you. This is good practice. · Service: Pay attention to the ringing of the inkin. There’s often confusion about when to stand and when to sit. The inkin is used for “directions to the assembly.” When it’s rung twice in rapid succession, it’s saying that if you’re sitting you need to stand, and if you’re standing you need to sit. A rolldown (rings following the pattern of a ball bouncing, getting faster and faster) signals that a series of full prostrations is about to begin. · Pay attention: Observe others around you and follow their actions. Avoid watching the doshi and the doan – they often do different things from everyone else. Many smaller details have not been addressed here. Watch and follow others and ask questions later. For example: Is there a reason everyone enters our zendo starting with their left foot, or is it just an amazing coincidence? By asking such questions we further refine our practice. There is more to zendo rules than keeping things orderly. Our struggle with them provides an opportunity to practice and to observe our egos in a safe environment. In everyday life we find ourselves feeling embarrassed or awkward. Often, because we don’t feel safe we can be defensive, go into denial, or try to escape and avoid the issue. But in the zendo we don’t escape. We remain in the awkward situation. Maintaining our awareness, it is harder to go into denial. There is no excuse making either, because, for starters, we’re maintaining silence! Instead, we get a chance to observe ourselves in confusion (“Some people are getting up now but some aren’t…so what am I supposed to do?”) and our embarrassment (“Everyone just did that right except me.”) and our worry (“Am I going to totally mortify myself again today?”) and to let all of that go and just be here in the present moment. When we don’t try to escape from our mistakes but remain right there in the zendo, we grow stronger. As we come to the zendo more often, we begin to notice that EVERYONE makes mistakes with the zendo rules, even the teacher on occasion. Suddenly our concern and confusion, which is centered on ourselves, expands to compassion for others and, in addition, for ourselves. There is no requirement for attendance, contributions or formal affiliation as a Buddhist in order to participate. You contribute to the center even if you only come once in a while or help out now and again. For people who want to become more involved, there are many ways to do this. You can sit on a weekly or daily basis, come to sesshin or all-day sitting, volunteer, or become a member. * A traditional member would, following the tradition of the original sangha in the Buddha’s time, contribute skills, time or needed items to the temple. Such a member might take care of office work, do maintenance chores, or contribute tea treats, vegetables, or needed equipment and supplies. Coming at least once a week to Zen Center would also qualify one for traditional membership. To take advantage of this option, a prospective member must speak with the Membership Director (appointed by the Board) and make a formal pledge of effort or materials, which would then be recorded as that person’s membership pledge. Not to mention the good feeling that comes from knowing that you are helping to provide a place where people can come when they need peace. * The annual membership meeting is for election of new Board members and for transacting business relating to the long-term goals of the sangha. To become a member of Cedar Rapids Zen Center, Email or call us.